This shop has been compensated by Collective Bias, Inc. and Bacardi. All opinions are mine alone. #RumInTheSun #CollectiveBias The following content is intended for readers who are 21 or older. 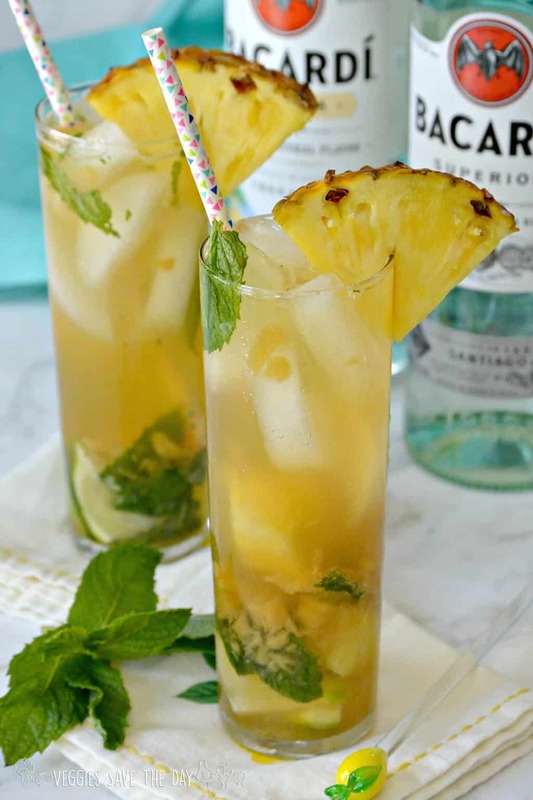 Enjoy a Fresh Pineapple Mojito made with Bacardi Superior Rum! They are easy to make with only a few simple ingredients. You may enjoy mojitos when you go out to restaurants, but they are really easy to make at home. This famous cocktail from Cuba has become very popular worldwide in recent years. And you only need a few basic ingredients to make them. I like to use Bacardi white rum in my mojitos. 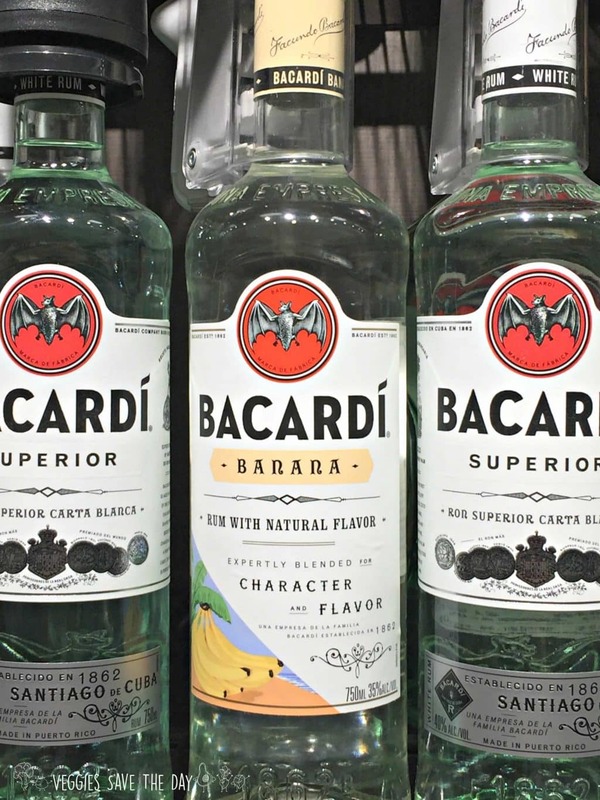 Bacardi is also perfect for using in other drinks such as rum punch, daiquiri, and pina colada. They even make different flavors of rum such as Banana. And it’s so versatile, you can add it to your favorite drinks such as Blackberry Ginger Mint Cocktails and Sparkling Watermelon Agua Fresca. I buy Bicardi at my local Kroger store, Ralphs. I love mojitos with all sorts of different foods. And they are great for entertaining. You can make a DIY taco bar and sip them by the pool or in your back yard. Everyone will be happy when they’re eating chips with guacamole and salsa and delicious tacos while sipping a fresh pineapple mojito. Or grill up some black bean burgers to enjoy with Curried Potato Salad and Summer Hearts of Palm Salad. They go with just about everything! What goes in a Fresh Pineapple Mojito? A mojito is traditionally made with white rum, sugar, lime, mint, and soda water. 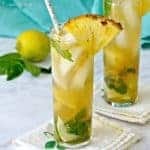 For this pineapple version, we’ll be making a simple syrup to sweeten the beverage made from chopped fresh pineapple, coconut sugar, and water. You can make the syrup ahead of time and refrigerate it until ready to use. Typically I only use a little sugar, but the amount depends on how sweet your pineapple is. Or make some more mojitos! 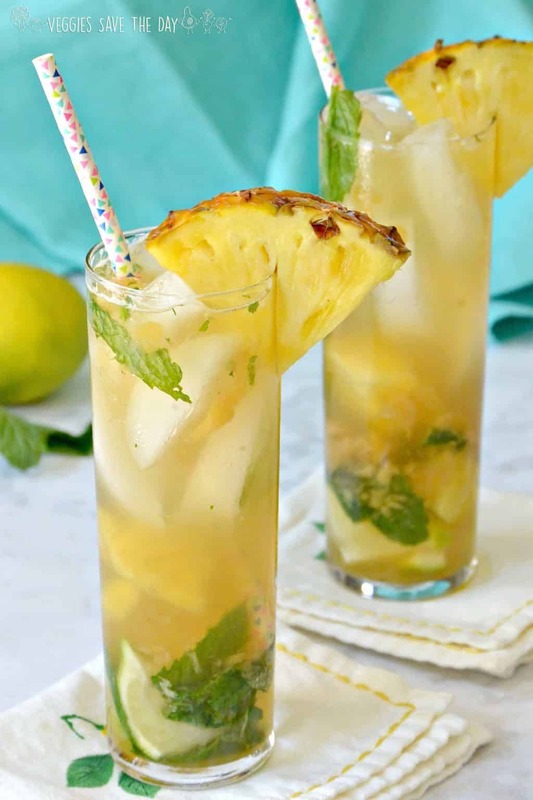 And look how easy it is to make a Fresh Pineapple Mojito! Simmer the 1 cup chopped pineapple, coconut sugar, and water over medium-low heat, stirring occasionally, for 30 minutes. Add more coconut sugar to achieve desired level of sweetness. 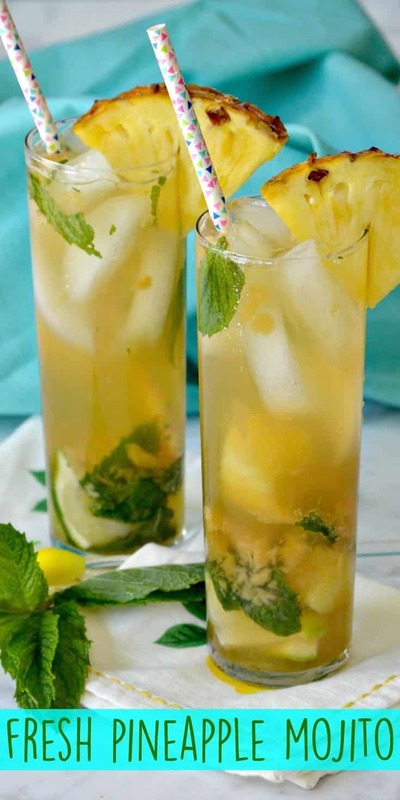 In a tall glass, add the lime, pineapple chunks, and mint leaves. Muddle a few times to release the flavors. Add the pineapple simple syrup and rum. Garnish with a wedge of pineapple, if desired. Enjoy! Add more coconut sugar if you prefer a sweeter beverage or if your pineapple isn't very sweet. Herbs, fruit, and bubbles! This is my ideal cocktail combination. You know how much I love a good pineapple mojito!!! Yum! I was thinking of you when I made them, Sarah! Now I need a drink! It looks so good. I love mojitos and the addition of that pineapple syrup is lovely. So refreshing! What a lovely summer mojito! You can get me with anything pineapple…a sip of the tropics! Thanks Rebecca! I love pineapple, too! Anything including pineapple ..I’m in! This looks like the ultimate way to unwind this weekend! Indeed! And I love pineapple, too! The looks so light and refreshing for hot summer days! I could go for one of these pronto! Thanks Jenn! They are really good! Thank you, Supriya! I hope everyone enjoys it!